There's a new movie that's just been released by Excel Entertainment and Deseret Book, called "Believe". It's based on a true story, taking place in 1984. 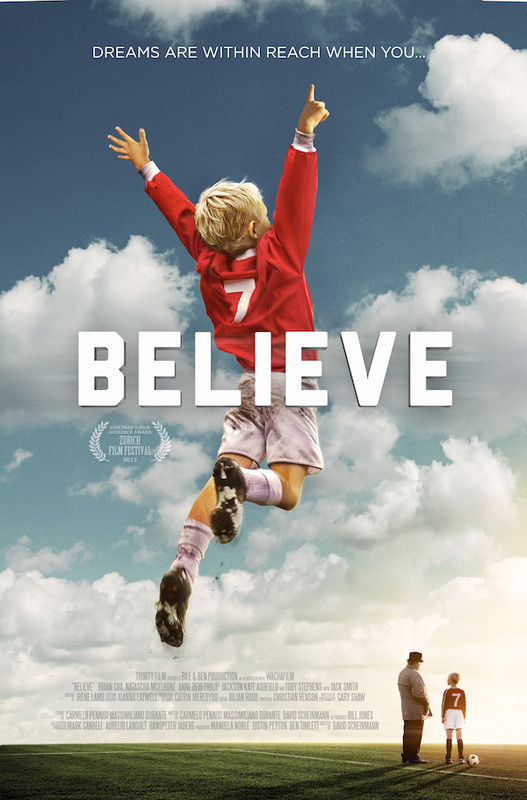 The story of a legendary soccer (football) manager who helps a young boy fulfil his dream. The two of them find out they have more in common than the love of a game and help each other through. I hate to tell too many details about books or movies because I don't want to give anything away! Can I Watch With My Kids? We watched the movie with our girls (aged 5 and 8) and they liked it. The only thing that was in it that made me nervous (for the girls to see) was a flashback (a couple of times) to a plane crash. I wasn't sure if it would scare the girls but they seemed to handle it fine. The other thing to consider when watching with children is that the movie takes place in England and sometimes the accents are a little difficult to understand. The film was released in select theatres on September 12th and is available to order through Deseret Book's website. Disclosure: I received a DVD screener copy of the film for review purposes. I was not compensated in any way for my review and all opinions are my own!